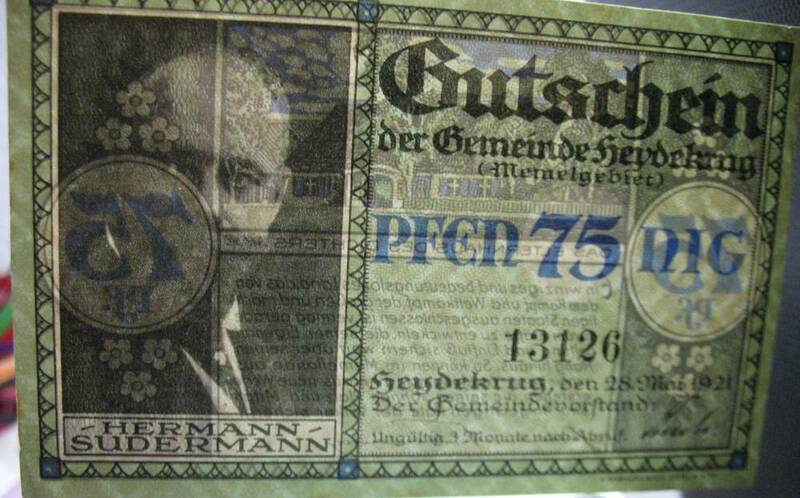 The engraving on banknote of Hermann Sudermann portrait and the House of his Parents in Hezdekrug (now Šilutė, Lithuania) on reverse are made after this photos. 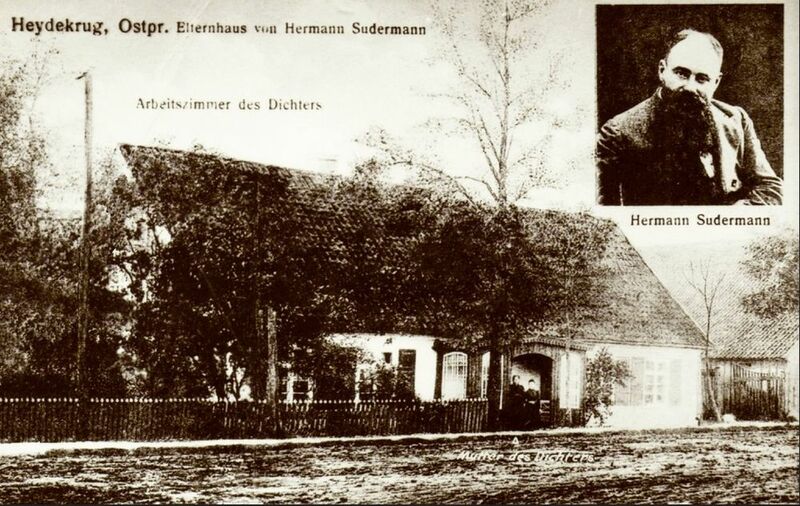 Hermann Sudermann and the House, where he was born in village Matzicken, Kreis Heydekrug (now village Macikai, near Šilutė, Lithuania). The photo made approx. in 1896. Hermann Sudermann (September 30, 1857 - November 21, 1928) was a German dramatist and novelist. He was born at Matzicken, a village just to the east of Heydekrug in the Province of Prussia (now Macikai and Šilutė, in southwestern Lithuania), close to the Russian frontier. The Sudermanns were a Mennonite family long settled near the former Elbing, East Prussia, (now Elbląg), Poland). His father owned a small brewery in Heydekrug, and Sudermann received his early education at the Realschule in Elbing, but, his parents having been reduced in circumstances, he was apprenticed to a chemist at the age of fourteen. He was, however, able to enter the Realgymnasium (high school) in Tilsit, and to study philosophy and history at Königsberg University. 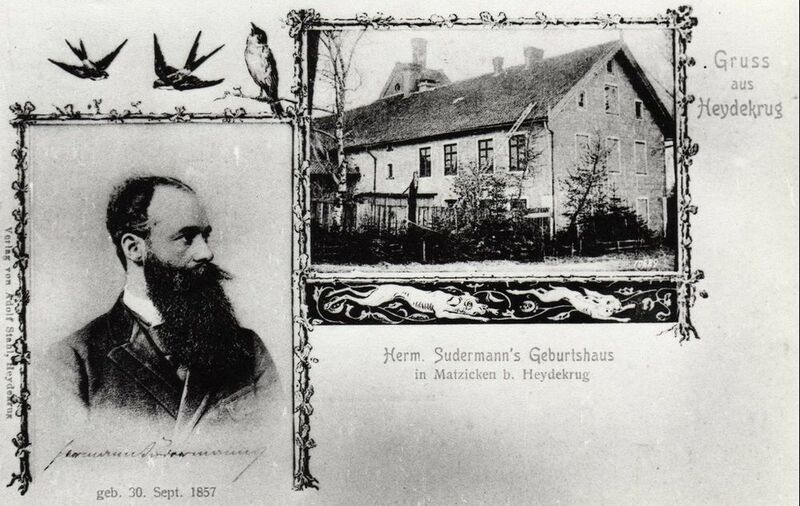 In order to complete his studies Sudermann went to Berlin, where he was tutor to several families, including that of the author Hans Hopfen (1835-1904). 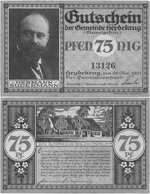 Next he became a journalist, and was in 1881 and 1882 the co-editor of the Deutsches Reichsblatt. He then devoted himself to fiction, beginning with a collection of naturalistic short stories called Im Zwielicht ("At Twilight", 1886), and the novels Frau Sorge ("Dame Care", 1887), Geschwister ("Siblings", 1888) and Der Katzensteg ("Cats' Bridge", 1890). These works failed to bring the young author as much recognition as his first drama, Die Ehre ("Honour", 1889), which inaugurated a new period in the history of the German stage. This play, originally intended to be a tragedy, but on Blumenthal's advice given a "happy ending," was a pseudo-Nietzschean attack on the morality of the lowly. He married the novelist Clara Lauckner (1861-1924), née Schulz on 20 October 1891. She was a widow and already had three children from her previous short-lived marriage, and she would have one child with Sudermann: a daughter, Hede. They lived in Königsberg for the next two years, before moving to Dresden, and then Berlin in 1895. Another successful drama, Heimat (1893), was translated into English as Magda (1896). In this play, Sudermann emphasizes the right of the artist to a freer moral life than that of the petty bourgeoisie. It has some of the moralistic and didactic tendency of the later French dramatists, especially the younger Dumas, and all of their technical finesse. Productions featured some of the best known actresses of the time, including Helena Modjeska, Sarah Bernhardt, Eleonora Duse, and Mrs Patrick Campbell. He had a large following in Japan. During the 20th century, his plays were the basis of more than thirty films. Sudermann returned to novels with Es War ("It Was", 1894, the title referring to Section 2, §1 of Nietzsche's Unzeitgemässe Betrachtungen), a protest against the fruitlessness of brooding repentance. In 1902, he moved to a mansion with extensive grounds at Blankensee, and used his newfound wealth to collect paintings and sculpture, and to take trips to Italy, Greece, Egypt and India. At the commencement of World War I, Sudermann was enthusiastic, publishing a Kaiserlied ("Song of the Kaiser"). In autumn 1917, he organised the Frohe Abende ("Cheery Evenings"), a programme promoting artistic endeavours among the common people, for which he received an Iron Cross Second Class on 5 April 1918. 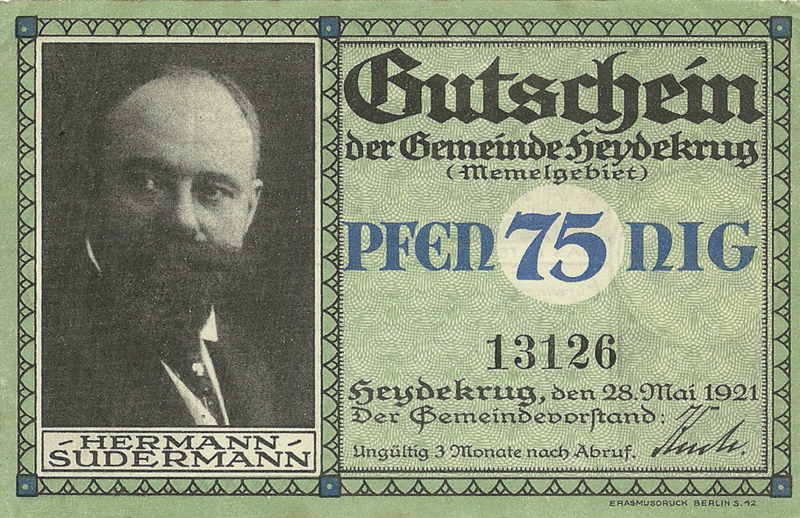 After the end of the war he helped found the Bund schaffender Künstler ("Society of Creative Artists"), which posed as a centrist political force and which earned him the reputation of an opportunist. The most important of his later works are Litauische Geschichten ("Lithuanian Stories", 1917), a realistic portrait of his homeland, and a volume of memoirs in 1922. His last major work, written after the death of his wife in 1924, was Die Frau des Steffen Tromholt ("The Wife of Steffen Tromholt", 1927), a semi-autobiographical novel, which turned into a movie in 1929 named Wonder of Women. He had a stroke in 1928, and died of a lung infection shortly afterwards, in Berlin, aged 71. His stepson Rolf Lauckner set up the Hermann Sudermann Foundation to support young dramatists. 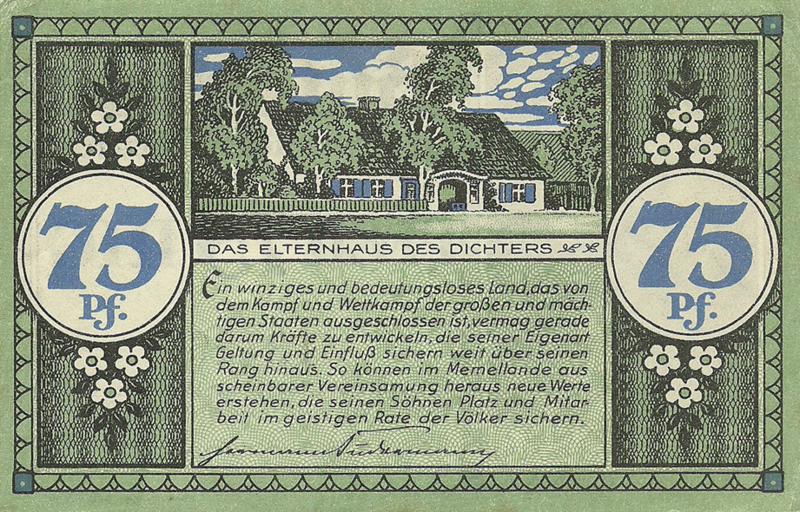 At the bottom is an inscription in German: "Not valid in 3 Month after withdrawal". Centered, above, is Sudermanns Parents House, where he used to grow up in Heydekrug (now Šilutė, Lithuania). Under it - an excerpt from the poem (unknown to me till now) by Hermann Sudermann. "..Ein winziges und bedeutungsloses Land, das von dem Kampf und Wettkampf der großen und machtigen Staaten ausgeschlossen ist, vermag gerade darum Kräfte zu entwickeln, die seiner Eigenart Geltung und Einfluß sichern weit über seinen Rang hinaus. So können in Memellande aus scheinbarer Vereinsamung heraus neue Werte erstehen, die seinen Söhnen Platz und Mitarbeit im geistigen Rate der Völker sichern.."
"..one tiny and insignificant country that is excluded from the struggle and competition by the great and mighty States, can just about to develop forces, that will make stronger its character and influence far beyond its ranks. So can rise in Memelland (Memel Territory) from apparent loneliness out new values, securing his sons place and co-operation in the spiritual council of nations...."
Denominations in numerals and words are on right and left sides. On background are chamomile (flowers).